If you want to new scenery for the price of a walk-on ferry ticket, the newly formed Vashon Beach Naturalists program will be hosting a beach walk at the north end Vashon ferry terminal Friday (26th) from 8-10PM. You can also wait until February 25th to join the Kitsap crew again at the Southworth Ferry dock (7-8:30). These are great opportunities to learn more about the life on your beaches. PS. “chaeta” is new Latin from the Greek word for long hair. … wild hair… At least the marine worms might get a giggle out of it. Most marine worms are polychaetes (many bristles/hairs). Beach walk partners include: WSU Kitsap County Extension, Washington Sea Grant and People for Puget Sound – Contact: Peg Tillery PTillery@co.kitsap.wa.us or Jeff Adams jaws@uw.edu for questions or more details. From fiction to real life: Tropic whale in South Puget Sound? Hello All! I started this blog last week then immediately left for a week-long meeting in Los Angeles. Apologies for my neglect and thanks much to those of you who commented and responded to my initial blog. I’ve got a few things to share from LA but will wait until I get home and download the pictures. In the meantime, if you haven’t heard through other avenues, what appears to be a juvenile (still nearly as long as my house) Bryde’s whale has washed up in South Puget Sound. It likely solves some mystery whale reports from Liberty Bay residents to the Orca Network earlier this month. Bryde’s whales typically live in the tropics. This appears to be the first record of the whale in the Puget Sound. If you’ve ever read Jim Lynch’s The Highest Tide, you might find it ironic that this whale showed up near where young Miles began to witness strandings of several unusual and awesome creatures outside of their usual habitat. … If you haven’t read The Highest Tide, it’s a quick read loaded with marine biology, embedded in a great story. Greetings All and welcome to Sea Life! I want to take this initial blog opportunity to introduce myself and the blog, but I can’t resist sharing a cool critter. As the Kitsap field agent for Washington Sea Grant I have the privilege of working on issues that affect the marine resources on the Kitsap Peninsula, the Puget Sound, regionally and nationally. These include treating and infiltrating stormwater, engaging residents in marine related outreach and research and addressing aquatic invasive species issues from the local to national scale. Washington Sea Grant is a University of Washington based program that serves communities, industries and the people of Washington state, the Pacific Northwest and the nation through research, education and outreach. I was born in Corvallis, Oregon but grew up in rural Illinois on the banks of the Mississippi River. My Argentine wife says there’s a saying in her homeland that you always return to your umbilical cord (much more poetic in Spanish). True to that saying, I grew up with a powerful draw to the eastern Pacific. I came to Seattle in the early 1990’s to study biological oceanography, marine biology and freshwater biology before spending several years working on freshwater bugs in Portland, OR at the Xerces Society for Invertebrate Conservation and circling back to the UW with Washington Sea Grant. Though I’ve been a Husky half my life, I have been enjoying a fabulous working relationship with colleagues in WSU Kitsap County Extension. In fact this blog will regularly cross pollinate with Peg Tillery’s blog, Plant Life. Aquatic plants and animals fill our bellies, fire our imaginations and feed our economies. 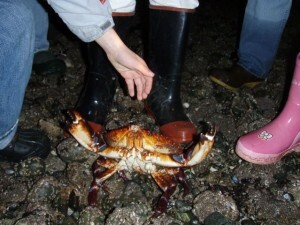 This blog gives us an opportunity to enjoy and appreciate the crabs, clams, fish, mammals, insects, plants, seaweed and all other manner of aquatic life that affect and are affected by the Puget Sound, Hood Canal, Salish Sea and Pacific Ocean and the actions we take in their watersheds. There is no shortage of topics to discuss, but my hope is that readers will send me additional questions and ideas for topics that interest them – just email jaws@uw.edu. 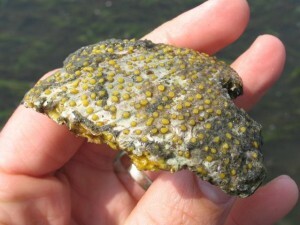 For starters, I wanted to share the humble yellow boring sponge (… boring… as in holes… I hope…). This sponge actually lives with animals that build their shells or houses out of calcium (barnacles, oysters, scallops and clams are favorite hosts). The sponge will chemically bore through the shell, growing through the interior, and punching through the exterior. If burrowing is extensive enough, it can weaken a living host or affect muscle attachments of the organism’s soft body to its shell. Once the host is dead, the sponge breaks the shell down into sediment, also releasing nutrients and minerals back into the water – a function similarly important to soil organisms breaking down leaves or moss and lichens breaking down rocks. At least one species of this sponge is thought to have been an unintentionally hitchhiker on Northwest-bound aquaculture shipments from the Atlantic a century ago. You’re more likely to find bits of Swiss cheesed shell than the living sponge, but it’s something to watch for next time you’re on the beach.